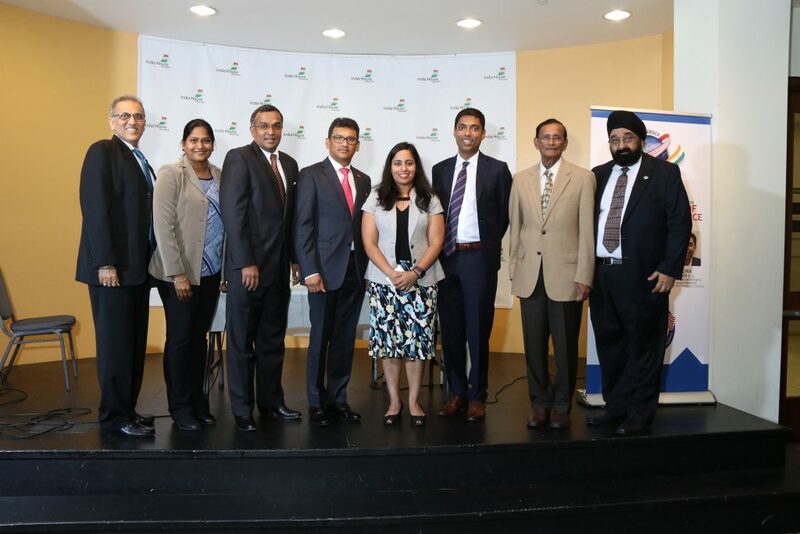 The Indo-American Chamber of Commerce of Greater Houston (IACCGH) and American Society of Indian Engineers and Architects (ASIE) hosted their first joint event at India House on October 4, 2018. The event presented three prominent engineering and business leaders; Mr. Sudhakar Kalaga, President – KIT Professionals, Inc., Sanjay Ramabhadran, Principal, Versa Infrastructure and METRO Board President and Mr. Varuna Singh, Alternate Program Director for TxDOT-Houston for a panel discussion titled “The Intersection of Engineering, Commerce and Business”. IAACGH’s Executive Director Mr. Jagdip Ahluwalia started the proceedings by welcoming the audience to the event following which, Chamber President Mr. Swapan Dhairyawan gave an insight as to the collaboration with various Associations during the year and ASIE’s Secretary and Board Member Ms. Chaitanya Gampa update the ASIE activities. The Program Chair and Board Member Ms. Archana Sharma, served as the moderator for the panel discussion, took over the stage and shared her excitement in presenting this event with the hope that it benefits members from both organizations. She said the goal for the event was to present speakers from different paths of life “public, private and entrepreneurial” to discuss engineering, business and commerce that lead to the panel of the day. She introduced each speaker by sharing a personal note about their childhood dream for a career – a cricketer for Mr. Kalaga, a bus driver for Mr. Ram and a lawyer for Mr. Singh. The panel discussion started with each panelist giving the audience a synopsis of their “Engineering Journey”. The panelists further discussed personal experiences during their career and shared lessons learnt. When asked how to balance technical growth and business growth, all three agreed that technical growth is most critical and if achieved, business growth and profits would follow automatically. While discussing engineers’ role in politics, the panelists agreed that engineers have a big influence on policies and must take initiative to participate and advise the policy makers to have an impact on the society. When asked about what crucial investments needed to be made for Houston’s infrastructure, both Mr. Singh and Mr. Ram indicated “public transportation” as the most important need while Mr. Kalaga felt “drainage” improvements were critical. The panelists further shared their wisdom when asked to share “one” piece of advice for the audience. Mr. Singh and Mr. Ram, both acknowledged the importance of “communication” while Mr. Kalaga urged the audience to work towards becoming an expert and leader in their chosen path of life. Ms. Sharma opened up the panel to the audience which lead to discussions on varied topics including engineering ethics and life-work balance. Ms. Sharma concluded the panel discussion thanking the guests for the candid conversation. The event was attended by 80+ attendees and the dinner was catered by Madras Pavilion.